Menton Daily Photo: Merry Christmas! 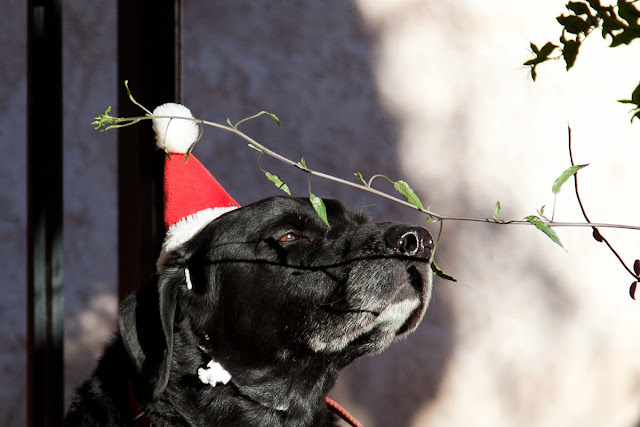 A very Merry Christmas to you, dear readers of Menton Daily Photo. And a heartfelt thank you for your continued support and encouragement and comments. And Marlow, who lives in Monte Carlo, says woof! Un très Joyeux Noël à vous , chers lecteurs de Menton Daily Photo. Et un grand merci pour votre fidèle soutien, vos encouragements et vos commentaires. Marlow, qui vit à Monte-Carlo, vous dit wouf ! What a sweet Christmas photo. Wishing you all of the peace and joy of the season. Seems also the animals have respect when they see you with your camera! Very cute shot, the lighting is great, too! Please let Marlow know that our Schnauzer Bella and our Boxer Simon said "woof woof" (Merry Christmas). Love your photos (DUH?). Thank you for posting them with such smart and informative text. Our Maggi is so happy that other canines are burdened with their owner's annual holiday dog card as she is! Maggi and Lexie send their own messages: woof! woof! May you have a delightful day, filled with friends and good cheer! may the day and the year to come be filled with the most pleasing woofs. love from vermont. A merry Christmas to you too Jilly! Merry Christmas to you, Jilly!Thank you so much for sharing your talent and your beautiful home with us everyday. It looks like Marlow has it made. More proof that dogs are the species running the show. The same to you dear Jilly and please give Marlow a bone pour moi!